For several years now, Nature Conservationists and NGOs are pleading for a logging moratorium in Romania´s last primeval forests. Besides Videos of illegal wood sales, photo documentaries like the deforestation report by Prof Hannes Knapp, activists from 6 European Countries decided on March 10th, to block several logging trucks again transporting timber cut in the Vidraru Valley. This valley is one of the areas with remaining primeval virgin forest. 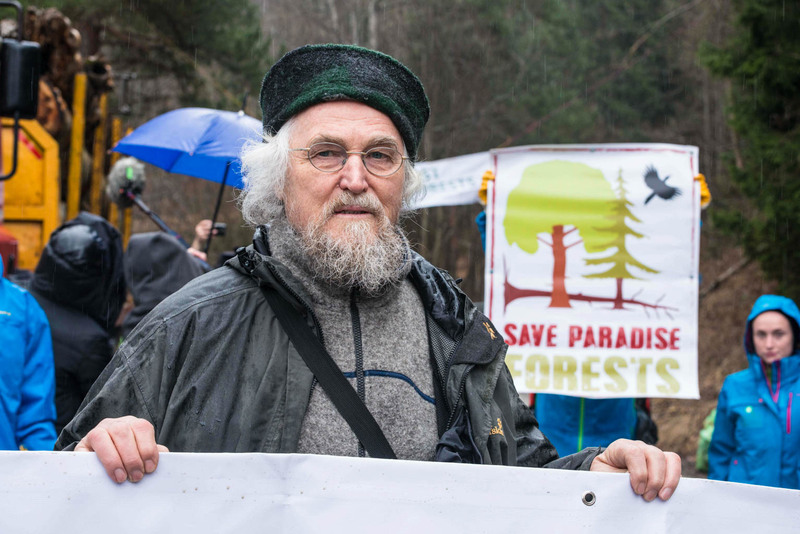 Under the Slogan “Save Europe´s last Paradise Forest” the activities led by Agent Green and supported by Euronatur and its representative Prof. Hannes Knapp demanded from the Romanian Government and ultimately from the EU an immediate logging moratorium for all known and suspected primeval forest stands, especially in the National Parks and state owned properties. As an initiator of the inclusion of Europe’s last virgin beech forests into the UNESCO World Heritage list, I stand for these last paradise forests – not only with my scientific work, but today also with my own body at the site of destruction. These forests are of an outstanding global natural heritage and must not be destroyed. Professor Hannes Knapp from Germany, member of the Presiding Committee of the EuroNatur Foundation. Romania once had more than 200.000 ha of primeval forests in 2004, but many of the original primary forests have since been legally or illegally logged. In fact the Romanian Forestry law still permits the logging of primeval forests even in Natura 2000 protected sites including clear cuts. A significant amount of the processed timber is exported to Japan fuelled by a housing boom. The legal deforestation is exascperated by the continued illegal logging, which just recently caused the Forest Stewardship council to disaasociate itself from one of the many Timber companies in Romania Holzindustrie Schweighofer. While Holzindustrie Schweighofer publically pledges to change its corporate culture and install measures to identify illegal cut timber, many other timber processing companies still operate as they have been for many years. We urge you to now only sign the petition to help Agent Green fight this battle for the last remains of primeval forests in Romania but also to continue to pressure the FSC and the EU to continue their probes into the Romanian Timber industry. Without this pressure, the Romanian government is encouraged to even reduce the fines for illegally logging only increasing the illegal and legal deforestation of Romania.